Back in 1985, Mickey Mouse and his old pal Goofy taught kids visiting Disney's EPCOT Center about the future of energy in America—with a little help from the good folks at Exxon. Some kids at the World's Fair-themed park received a complimentary comic book entitled Mickey and Goofy Explore The Universe of Energy at Epcot Center. Tied to the Universe of Energy attraction, (which at that time was sponsored by Exxon), the comic is a fascinating snapshot of Exxon's PR strategy in the mid-'80s; one made just a little bit creepy given that it was directed at children. 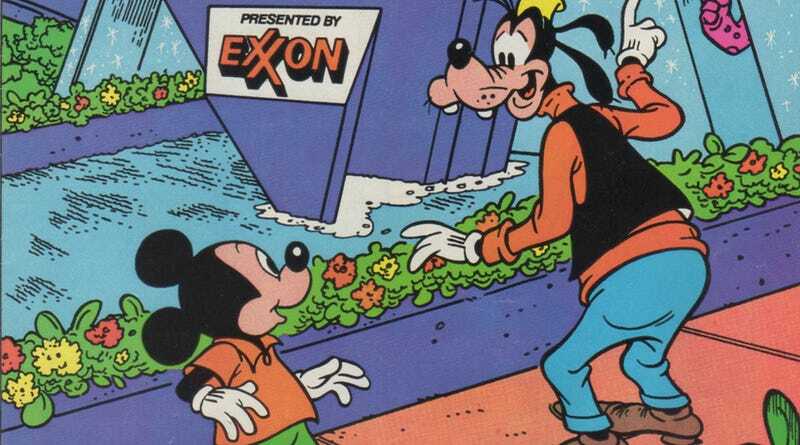 In the comic, Exxon speaks through Mickey Mouse, who wants you to know that while American oil companies were currently exploring alternative sources of energy, homegrown fossil fuels are really the bee's knees. Mickey leads Goofy through a cartoon-universe version of the attraction and explains America's energy situation in easy-to-understand, Exxon-sponsored fashion. Goofy learns from Mickey that it took millions of years for dinosaurs to be crushed into the sweet, sweet oil we know today. That oil powers Goofy's beloved car, 'Ol Bessie, which should be able to run "for many years to come." But Mickey warns that it's a "possibility" we might one day run out of oil! Energy conservation and being "energy-wise" by turning off lights and only driving 55 miles an hour is great, but these steps aren't enough. Mickey explains that it's important to find new sources of oil and natural gas. You see, foreign oil is fantastic. But after the oil crises of the mid-1970s, we can't depend on oil from other parts of the world to remain cheap. Mickey reminds Goofy that only a decade ago he had to wait in long lines just to fill up his tank. How can Americans like Goofy ensure they'll never get stuck in a jam like that again? By finding more oil in America, of course! Mickey and Goofy the set off to discover where oil comes from. A few pages later they find themselves in Alaska looking at an oil pipeline. A pipeline that runs to the port of Valdez, in fact. If the name Valdez rings a bell, that might be because in 1989 the Exxon Valdez oil tanker was responsible for the second largest oil spill in U.S. history. Gawrsh, that was quite a mess! A bit later in the comic Mickey then explains how using substitutes to oil and natural gas will help make sure that we won't run out. "Substitutes?" Goofy asks. Mickey goes on to show Goofy that electricity generated by coal is a perfect example. Mickey tells Goofy about how lucky the United States is to have such an abundance of coal—a resource that should be around for another several hundred years, especially if we frack Space Mountain. Mickey spends a couple of pages showing Goofy promising technologies like nuclear and hydroelectric power, and by the end of the comic Mickey finally gets to solar power. We learn that The Universe of Energy has solar panels on its roof, which helps power the ride's cars. "Partially power," anyway. Mickey seems pretty excited about the prospect of using solar energy in the future. After it "becomes more affordable," of course. Mickey and Goofy head over to the "Energy Exchange" part of The Universe of Energy where they can learn more about the future of energy in America. Goofy hops on a stationary bicycle and gets all tuckered out. Mickey helpfully explains that Goofy would have to pedal for nine days to produce the same amount of energy that's in just one gallon of gasoline. So yeah, screw bicycles too I guess. Images: scanned from the 1985 comic book "Mickey and Goofy Explore The Universe of Energy at Epcot Center"